The Noise Next Door is an English comedy troupe made up of four comedians: Matt Grant, Tom Livingstone, Sam Pacelli and Robin Hatcher. The group is most commonly known for their performances at the Edinburgh Fringe Festival which have sold out eleven consecutive times, prompting critics to label their shows as “comedy gold”. The group is not only known for their stage work, but have also been featured on both television and radio throughout the UK including BBC One, BBC Three, ITV1, BBC Radio 1 and BBC Radio 4. 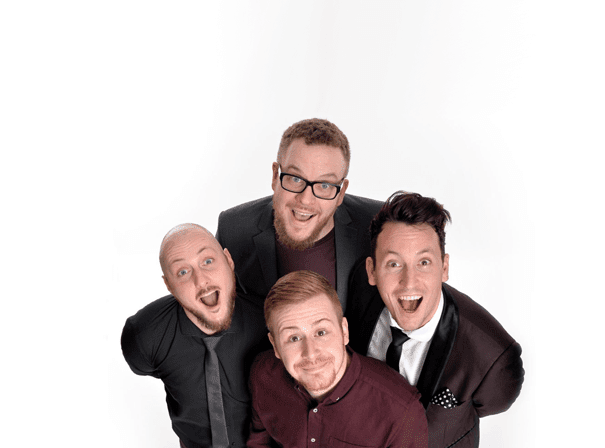 Their improvisation style makes them a versatile comedy group fit for a multitude of occasions and events, performing for students, armed forces, corporate events, as well as club and festival crowds. They have worked alongside the likes of Michael McIntyre, Al Murray, and Harry Hill and have even been nominated for a coveted Chortle Award. The Noise Next Door are embarking on an extensive 2019 tour across the U.K., with 55 dates already in the calendar.